The Charles Darwin Research Station on Santa Cruz Island near the town of Puerto Ayora, is one of the best known and most visited sites in all of the Galapagos. 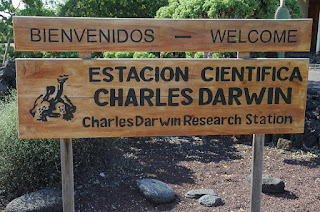 The CDRS is a joint effort of the Charles Darwin Foundation and the Galapagos National Park Service to protect, conserve, keep from extinction and repopulate the many Galapagos Tortoise species that are endemic to the islands. 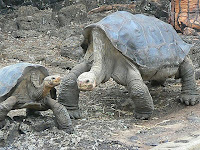 CDRS was created in 1964 and its tortoise preservation program initiated in 1965. From 1971 until his death in June 2012, CDRS was the home of the biggest celebrity in the Galapagos Islands, Lonesome George. George, who lived at the CDRS for more than 40 years, was the last extant tortoise from Pinta Island and had, for many years, been the focus of concerted efforts to breed him with other similar, but not identical, tortoises. Unfortunately, all efforts failed and when George died, so did the species. For an extensive discussion of Lonesome George and the efforts to reproduce the species see my earlier post written right after his death.